By putting students in the role of the green chemist, our field trips and outreach experiences empower students to become the next generation of problem solvers. At our shared headquarters in Wilmington, MA, Beyond Benign’s partnership with the Warner Babcock Institute for Green Chemistry enables us to offer field trips to a one of a kind green chemistry invention facility. Throughout the year, Beyond Benign also participates in a number of community events, ranging from local STEM nights to national science festivals. Check our calendar for events near you or invite us to your local event! 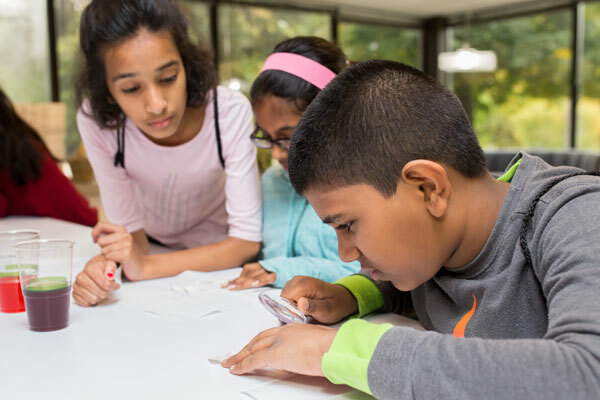 Join us at our Community Lab for interactive field trips designed for middle school, high school and college students. Our unique field trips feature an introduction to green chemistry, a hands-on lab experience inspired by green chemistry technology and an interactive tour of the Warner Babcock Institute for Green Chemistry, where students hear from scientists about green chemistry innovations. The experience is designed to expose students to the exciting field of scientific research as well as the myriad of career opportunities available in the growing fields of STEM, sustainable science and green chemistry. Reach out to us to book your 2018-2019 field trips! Annually Beyond Benign reaches 2,000 community members at events primarily in the greater Boston area. We partner with local area schools, organizations and institutions to provide green chemistry outreach. Our team of college student Outreach Fellows volunteers participate in events facilitating fun, educational and engaging activities that feature green chemistry innovations. Is your school or organization hosting a family STEM night? Are you looking for green chemistry careers and innovative hands-on activities?